6 HDMI ADAPTER: 2 x Flat Left 90 Degree HDMI Adapter, 2 x Flat Right 90 Degree angle HDMI adapter, 1 x 270 Degree HDMI Male to Female Adapter, 1 x 90 Degree HDMI Male to Female Adapter. COMPATIBILITY: Support resolutions up to 1920*1080, support Audio Return Channel, HDMI Ethernet Channel and 3D. 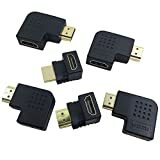 FUNCTION: These HDMI adapters (Right, Left, Up, Down, Multi-Angle) avoid bending HDMI cables and relief the strain on HDMI ports to increase the lifespan of your device and HDMI cable. GOLD-PLATED: Gold-plated connectors can resist corrosion while offering optimum signal transfer. PROVIDE THE FLEXIBILITY: When space is limited, adapter can easily adapt to those tricky angles.